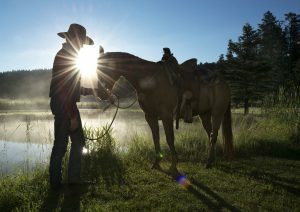 Montana Resort Ranches offer western activities with higher end amenities and dining experiences. Enjoy the “softer” side of the guest ranch stay. The amenities may be a bit plusher, what we like to call “rustic elegance” but these ranches still compliment the western lifestyle. Resort ranches may offer greater ability to accommodate larger numbers of guests and conferences. 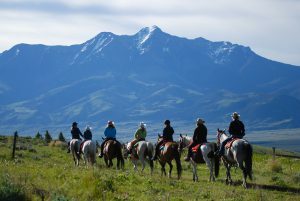 It’s a given that our main activity is horseback riding, but resort ranches also offer a variety of other activities to share the great outdoors and all the splendor of Montana. From guided hikes to world class fly-fishing, playing tennis, or soaking in the pool or getting a massage, there are activities for everyone. Perhaps our chef will prepare gourmet delicacies served on linens in our dining room, with a special glass of wine – or a lavish barbeque by the water. We invite you to enjoy western hospitality at its finest. Click here to request brochures from Montana dude ranches. Montana Dude Ranch rates listed represent a typical adult (per person) week long stay during the peak summer season and is based on double occupancy accommodations. Actual rates may vary slightly and children's rates are typically available. Located near Yellowstone National Park in beautiful Paradise Valley, Mountain Sky has offered fun for the entire family since 1929! A huge variety of activities, gourmet dining, and the spectacular beauty of Yellowstone Country will ensure that everyone in the family enjoys the vacation of a lifetime. Situated on the shores of Flathead Lake in North West Montana, Flathead Lake Lodge is the only guest ranch in the country where you can combine a Western Dude Ranch experience with an all-American Lake vacation. Due to its location Flathead Lake Lodge is the ideal property for Multigenerational Family Travel.